Just a heads up that this one is a bit of a toughie. Click here to visit the Nikwax site and where it says “Play The Webquiz,” click the click “here” that applies to you. Register or login on the next page. 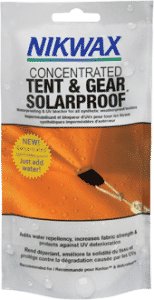 Finally just answer their questions correctly and you’ll be able to request a free Nikwax Tent & Gear SolarProof. You can use the clues they give as well as Google for help.